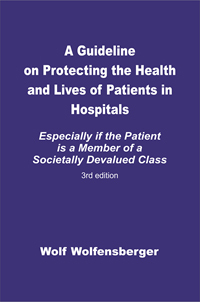 “This is a set of guidelines that can be given to a prospective hospital patient, and/or to the person’s family, friends and allies, especially where the patient is a member of a group or class that is societally disadvantaged, or generally held in low esteem. The purpose of the guidelines is to help defend and protect the well being – even the life – of a patient under hospital care. However, this monograph might also be applicable where a person is a patient in other health care settings, such as nursing homes.” (from the introduction, page 7). World renowned human service reformer, Professor Wolfensberger (Syracuse University) was involved in the development and dissemination of the principle of normalization and the originator of the theory of Social Role Valorization (SRV), the program evaluation tools PASS 3 and PASSING, and of a number of service approaches that include Citizen Advocacy.